President of Ukraine Petro Poroshenko has taken a decision to dismiss Luhansk Regional Military and Civil Administration Chief Heorhiy Tuka and today will introduce a new governor, an informed source has told Interfax-Ukraine. An interlocutor said on Friday the new head of Luhansk regional military and civil administration to be introduced on Friday. The reason for replacing Tuka remains unknown. Some Ukrainian media outlets have named Petro Poroshenko Bloc MP Yuriy Harbuz, a native of the Luhansk region, among possible candidates for the post. 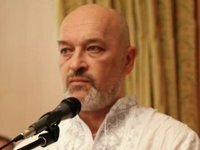 Heorhiy Tuka, head and founder of the People's Rear volunteer group, became head of Luhansk Region Military-Civilian Administration on July 22, 2015, replacing Hennadiy Moskal, who was subsequently appointed to head the Zakarpattia region administration.